HAROLD REITMAN, M.D. (HR): Hi I’m Dr. Hackie Reitman welcome to another episode of Exploring Different Brains. 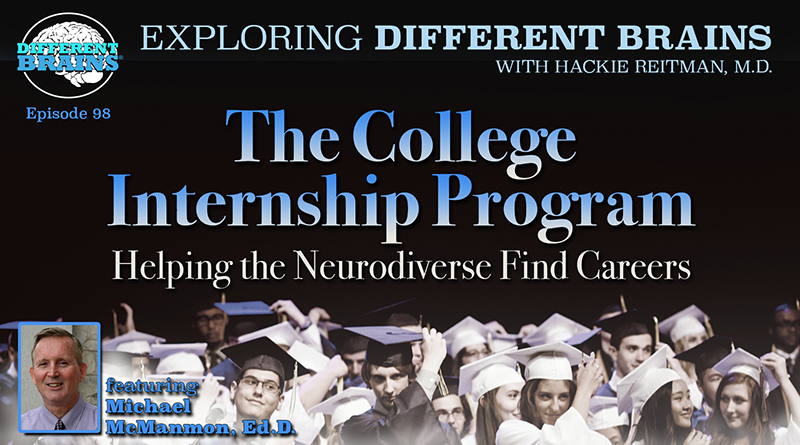 Today we have the honor of having with us the founder of the college internship program Michael McManmon, who founded this program that helps so many of us whose brains might be a little bit different, whether we have Asperger’s, autism or ADHD or you name it. And helps us learn independence, the transition from college life to employment and so many other things. We’re speaking to Michael who is up in Massachusetts. Michael how are you? MICHAEL McMANMON (MM): I’m really good how are you doing? HR: Great, it was great to see you out in Portland at the US Asperger’s and Autism event out there and everyone was mesmerized by your talk in which you shared a whole bunch of stuff. Very inspirational. HR: Because of so much I’ve learned around you when we’ve shared the stages at Portland, Tucson, parts unknown. I kind of want to do this interview in reverse. Instead of starting with how did you get into this, I want to go backwards I would like you to tell our audience exactly what you’re doing now and what college internship program is doing, and what it is now. I want a snapshot of today and then we will go backwards. MM: Well right now I am sort of semi-retired. And what I do now for the college internship program is I speak, I write books, I’ve written three books and the third one is coming out, that’s what I was speaking on in Portland. It’s coming out in a couple weeks. It’s called “M ploy” and it’s a college readiness, work readiness handbook for young adults on the spectrum and with LD high school and college to get them ready for work and employment. And what college internship program does is we have five centers around the US for 18 to 26-year-olds who need comprehensive curriculum to help them either bridge the gap between a four-year college or employment and independent living. We provide a very comprehensive curriculum in social thinking, executive functioning, sensory issues, everything from therapy to apartment living, recreation and etc. Our other programs that we have are high school summer programs at five colleges around the country serves 16 to 18-year-olds and they are two-week programs to prep them for going to a program like ours for independent living. And what we do there is we have them create a person centered plan during that two weeks for themselves going forward. We also have one other program, which is called “M-ploy”, which is sort of for those kids that are failure to launch. The ones that are on the couches at home who are above 20 or 26 or so and they are not going anywhere fast and we take those kids and we do employment programs with them for a couple of weeks with employers and really get them restarted. So those are the three things we are doing now. HR: That’s great because one of the things that I speak about is that we have kind of inadvertently and with the best intentions discriminated against adults. It’s all about the kids, the kids, the kids. But guess what the kids turn into adults. 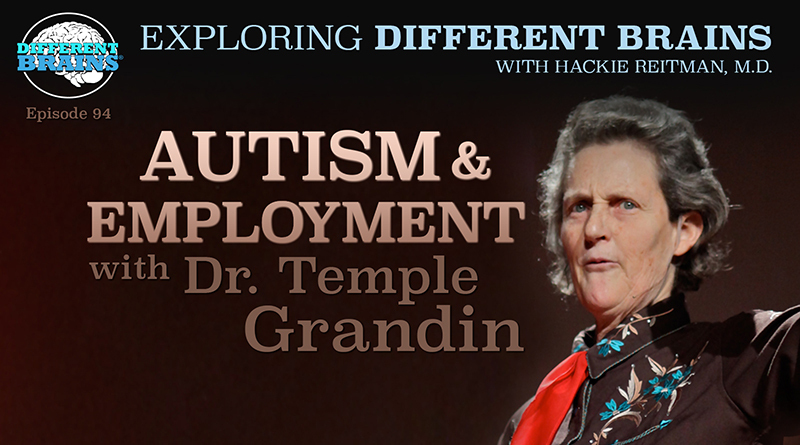 Another mutual friend Temple Grandin says it’s all about jobs. And these transitions are so tough. MM: Right. We’ve been standing in that spot for a long time before a lot of people, Temple and us. I’ve been saying it from the beginning that it’s not just about a degree, a kid can get a degree and not know how to hold a relationship, how to keep a job, how to navigate the world. So it has to be holistic in approach from the very beginning. Building portfolios for kids when they’re in high school or junior high and building those portfolios because as you saw in her movie when she goes to the farm managers and puts those portfolios in their faces that’s when they buy into her. Before that she’s just another goofy woman who they don’t listen to. HR: Tell us who is running the company while you’re what you’re calling “semi-retired.” Let me tell our audience, this guy was traveling all over the world lecturing, inspiring, writing, helping out with books and movies and documentaries. And talking to newbies like me. So who’s running the company? MM: Well I’m very fortunate to have a son who. You know I took on trips with students who have just sort of observed me, who sort of by accident got into our business when he was injured after college and I said why don’t you do some work for us, for our website, work with our students on the weekends and in the evenings while you are looking for jobs. And he got so into it and he was good at it he sort of went up through the system over 10 years helping us start programs and doing a lot of different things. And he’s much more talented in different ways than I am, he’s a better manager, he’s better with people than I am. I have different areas where I am very high functioning, but my emotional and social stuff is still depending on the time of day I can implode still. 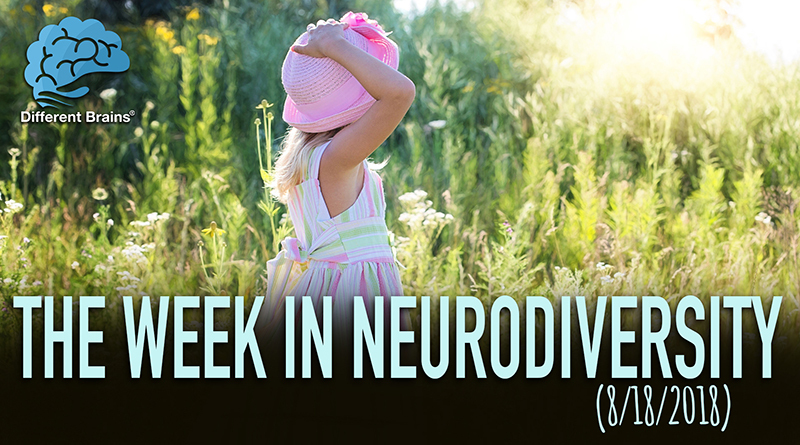 So he’s much more neurotypical, and he can handle things better. So I am very fortunate to have my son step into my shoes and he’s actually filling in very well. HR: Well it’s interesting in the following sense also. When you describe the College Internship Program then you describe yourself. The College Internship Program, you say Asperger’s, autism, ADHD, learning disabilities, so on and so forth. And what we are doing here at Different Brains, we’re saying is the principles that guide any good thing that we are doing whether it is the College Internship Program, or tools that we can use such as Aspertools and things such like that. It’s not only good for Asperger’s, autism, anxiety, bipolar, depression, you name it. And none of these things occur in isolation. So I know what you shared with the thousand people that were with us in Portland. And I wonder how much you would care to share with our Different Brains audience about all the different–for lack of a better term, I’ll say comorbidities, labels, that you, Michael, the founder of the College Internship Program who is helping so many people, how would you have labeled yourself? MM: Well I’m definitely a horse of a different color, let’s put it that way. And my children know it and have just sort of accepted it. And I didn’t know I had anything different going on totally until about 12 years ago when one of my staff helped diagnose myself and then I went and got formally diagnosed. But before that the reason that it was so difficult for me to understand who I am and what differences I had was because my family of origin, I had eight brothers and sisters and half of them were somewhere on the spectrum. Either ADD, Asperger’s, high functioning autism and on top of that was alcoholism and mental illness. So as a child I was smart enough to look at all of this. I was like a psychologist by the time I was 7 or 8. I would look at this and say this is not right, this one needs to do that this one is off base here, I didn’t have any power over it and I sort of just watched it and observed it and I said well I’m not going to do that. And so it turned out that I learned a lot about how to deal with people with learning differences at an early age. And my problem was seeing my own problem, which I sort of fit in and passed for neurotypical. I could easily pass my classes. I socially I wasn’t that out of it, I didn’t look that different so I just hung on the fringes of the other people around me and just sort of did what they did and they got by. When I started having relationships and I got into my marriage and in my business I just noticed that I didn’t pair up. Had a lot of outstanding positive qualities that people liked me because of them. Like perseverance, all these aspie qualities, intelligence, always wanting to do the right thing, doing whatever I would say, showing up, so I had all of those. Those really helped a lot in business dealing with people because if you are who you say you are, and you do what you say you do, the banks will like you and parents like you, and you follow through. So I had made a lot of mistakes over and over, social mistakes, everything. And luckily there wasn’t a political correctness as there is now because I would’ve been fired for some of the things I had said in staff meetings and thing, but since I’ve been diagnosed I’ve learned a modulator between here and here and this is a little five second delay that allows me to edit before I say things, which has helped my life immensely in every area and I’ve also been able to–I think the biggest area that is missed by people everywhere, colleges and everything is the sensory. They know about it but a college program like at a university what they are going to do about a sensory program for a kid who is in a college dorm. They don’t have someone that’s going to come and do that. They might have a social skills class or some kind of remediation, they might have tutoring and sometimes testing note takers and all these other things. But they don’t have that so I’ve had to learn how to do that for myself. And what that means is that, for example that day that you saw me speak at the USAAA, I swam late in the morning, I went up to the pool and swim, took a break and that reset me emotionally and socially. Then I knew it was later in the afternoon which I’m not good in the afternoon. I made sure the lights were correct in the room that they weren’t overwhelming me. I checked out way in the morning all of the audio stuff, to make sure, because if I had a problem I would get flustered. And so I do a lot of prep work for myself, I make sure to wear very comfortable clothes around my neck and that I ate before the presentation i had a power bar with a lot of protein in it that I just downed right before it. I took extra vitamins in the middle of the day. So I do all of these things to help myself be at my best. And actually my buddy Stephen Shore sort of taught me some of that, the way he does airplanes and navigates the world is amazing. And he knows how to judge how it’s going to land, how much sleep he should get, everything. So I’ve been able to be at the big boys’ table for the last ten years because I can keep myself in reasonable condition. because if I start saying stupid stuff or even expletives. You know, then it’s all over for me. So I have to be very careful. HR: I feel so lucky, because I get to learn from and hang around with and share the stage with people who are far, far, way, way in a different league than me. Such as, we’re just talking about a great man like Stephen Shore, who’s been on every continent except maybe one I think. MM: Antarctica. I don’t think he’s lectured on Antarctica yet. HR: Yes, I think that’s his only one. And he was a guy who was nonverbal and told to be institutionalized, then there’s Temple Grandin and then there’s you. It’s a very rarefied club that you guys are in, and I recognize happily that I’m just glad to be around that club. MM: Stephen’s mother did that for him and created his own preschool for him. My mom had so many children that she couldn’t do that for me. But what did do that for me was Catholic school because of the structure and most of the teachers. I only had one who was hell on wheels. But the rest were very supportive and I even had a couple that like one was like a brother in seventh grade who I still have contact with. Kind of like how Temple has contact with her high school teacher that helped her. My seventh grade teacher was only a few years older than me when he taught me. So I still have contact with him, he is in all of my books. He was my mentor and he guided me through some of the most difficult stuff in my family life and he didn’t even know it until I told him later how his standing for me was so important for me emotionally. And that is something I would like to say for the people out there. You don’t realize how important each child needs a connection like that, where they can go to someone. In my family, there was no one to go to. It was all a secret of what was going on so I had no one to talk to about anything. And you take that into you and that becomes part of your being. And you have to get rid of it somehow, or emote from it somehow. And being an Asperger’s I didn’t emote, I didn’t cry I didn’t do much of that stuff. So all that was absorbed came out later. Actually a lot later than most people, not in my teens but in my 30s and 40s I started to go through my adolescence my emotional adolescents. Which is not good for your marriage by the way. HR: How many have you had? HR: How many marriages have you had? MM: Two, but I’ve given myself permission–I said “Michael you are an extremely creative person that is difficult to live with and I gave myself permission that it is all right. I have these six children and 17 grandchildren and it is more than enough to keep me busy. And I’m friends with all the people that I have been in a relationship with. It was a unique experience for them, but we’re still friends and I share children with one of them you know. HR: Well that’s how life is supposed to be, it is a journey not a destination and we are all learning, and we learn how to be nice to each other. Which is a novel idea. When in doubt be nice. HR: And you are such a lucky man to have such a large extended family, and take all the things you have learned to the opportunity to part that knowledge to others. To all of our different brains audience out there who might be volunteers or teachers or coaches, what Michael just said about the mentoring process, just someone that gets it, who understands, who takes the time that Michael and I want all of society to do, to tune in on that individual different brain and remember this: often times, the individuals who have it the most difficult are the ones who can “pass” for a “neurotypical,” whatever that is as Michael was saying about himself. It’s not like if you’re an amputee, “well you’re missing a leg,” or if you’re severely this or that or anything. This is an intelligent person and this is very frequent, and let’s say high functioning Asperger’s and high functioning autism. MM: And to add to that I would say every corporation, every business needs an Aspie like me because what they can do for them is they can bring a unique perspective, and that’s what you want, you want to double check yourself, say “hey what’s different ways you could be doing these things?” They bring that to them. I also wanted to add something that we were talking about before. Here are some of the qualities of an Aspie that play out really well. As a dad, as a business owner, and even in a relationship. And other than the confounding ones. For example paying your bills on time all the time. I can go to the bank and they will do anything for me. I’ve never had a loan refused for a building or anything that we are doing with our business, I paid all of my kids’ college bills off. So they don’t have to carry those with them, I’ve helped them buy houses and start businesses. This is because fundamentally, I do things in a very structured way. I run my money, I use it well, and I don’t waste it and I’m on time for everything, and all these things like this add up to really good qualities. I never forget a birthday of any of my children, I have a personal gift, I probably already have half of them prepared for Christmas already for my 17 grandchildren and six children and their wives and husbands. And so it’s things that we do that are offsetting qualities that our spouses can see through that. They get all these other good things that come with the relationship, they might get someone that does not recognize if there stepping on their toes emotionally immediately. And that is a problem. But they get all these other things that I think are offsetting qualities. HR: A lot of our audience is gonna want to get in touch with you, how do they best get in touch with you and learn more about you and the college internship program. MM: Well they’re not going to call me and not going to text me but they can use my email which is “MMcManmon” my last name which is MCmanmon, it’s a tongue twister so it’s you can look at our website and get ahold of me which is collegeinternshipprogram.org and there’s all my stuff is on there and you can see what watch all the videos and do whatever you want. So basically yeah you can get me through the website that’s probably the easiest and I do have a blog on Psychology Today that’s pretty you know it’s there still what that’s the other way. MM: Oh yeah just go to Jessica Kingsley Publishers all my books are through her. The third one is coming out soon, like I said the next couple weeks. They’re all on JessicaKingsleyPublisher.com, she’s in the UK and in Philadelphia so they’re all worldwide and it’s real simple. Or you can just go on amazon.com if you want to save money. And I shouldn’t say that but you can get them used and just google my name and you’ll get all. HR: Well Michael it’s been a pleasure to have you here we’ve had as our guest today Michael McManmon of the college internship program and we hope to have Michael back very soon because he’s just loaded with information insights and inspiration thank you so much Michael. MM: Thank you for having me. 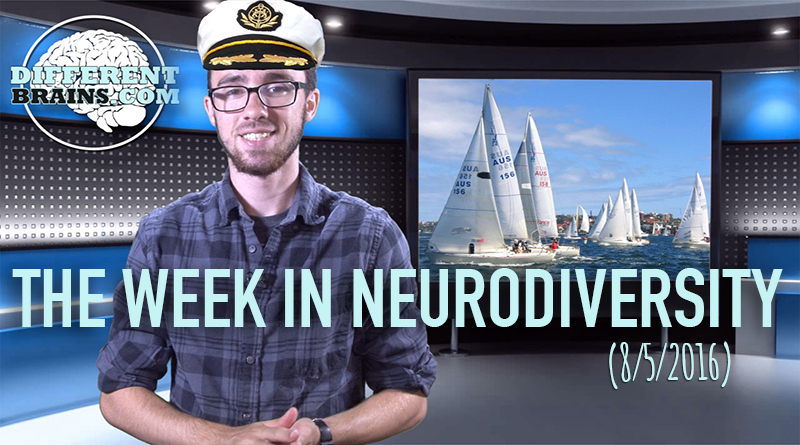 In this episode, a program helps children with autism learn to sail, robots assist with epilepsy, Jim Jeffries talks about having autism at age 36, and can parrots help with PTSD? All these stories in more in this week's episode!